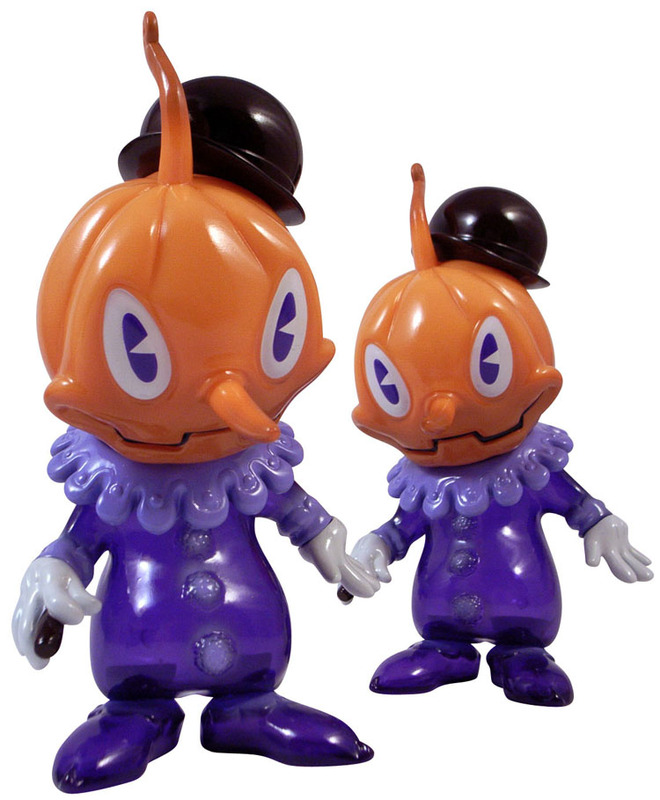 発売時刻になりますと“Order Form”ボタンから“専用ご注文フォーム”へジャンプします。 Japanese toy partnership Tomenosuke + Circus Posterus would like to announce our very first sofubi vinyl figure toy release: STINGY JACK by Brandt Peters. 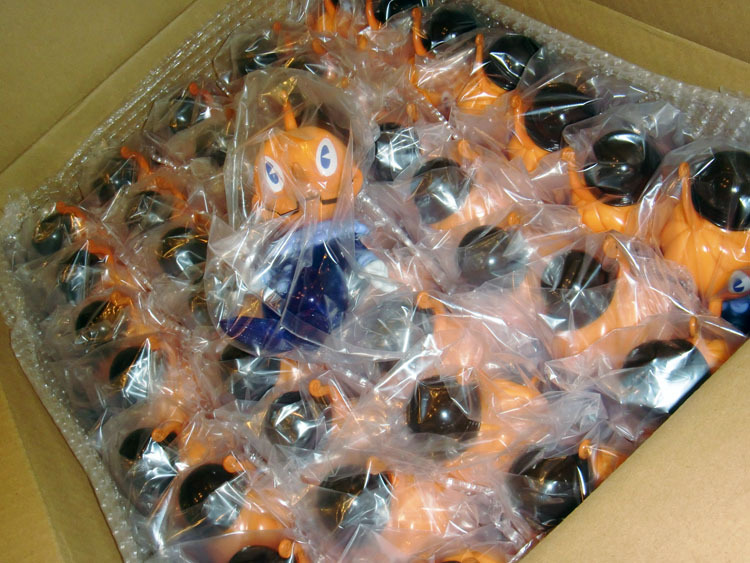 Tomenosuke Stingy Jack release date and time: 8/25/12 (12 midnight – JST) – ALL SALES OUTSIDE OF THE NORTH AMERICA, INCLUDING: Western and Eastern Europe, Central and South America, all of Asia and Pacific (Australia, New Zealand etc. ), Middle East – basically any non US and Canada location. 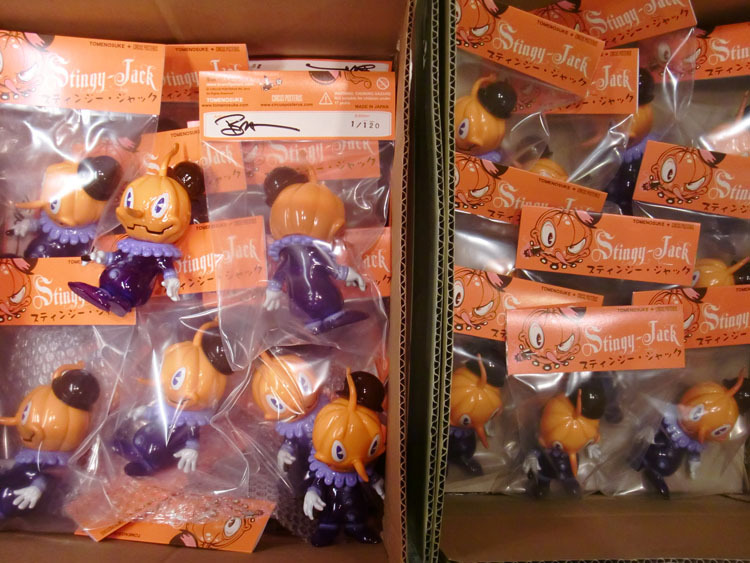 完成までにまる1年、感慨もひとしおだ。 The producing of the Sofubi Stingy Jack which began last September finally finished, and 120 units arrived from Obitus Plastic Manufacturing carefully packaged. I immediately sent half off to Circus Posterus. Since it took a full year to complete, I think that's all the more strong feelings towards this piece. たかがソフビ、されどソフビ、一朝一夕にはいかなかった。 I assumed that I had acquired plenty of experience in toy making from the resin figure Lady Butterfly and the high-end prop replica Tomenosuke Blaster, but what awaited me were the challenges and excitements unique to vinyl. The task at hand was to create a model for mass production without sacrificing the nuance of the original sculpture, while clearing certain limitations involved with forming from metal mold. I thought that I knew fully well of the material's characteristic of being sensitive to heat, but due to the high temperatures in the summer, the base of the figure's feet had deformed and could not support itself. As a result, We had to make the feet from scratch. 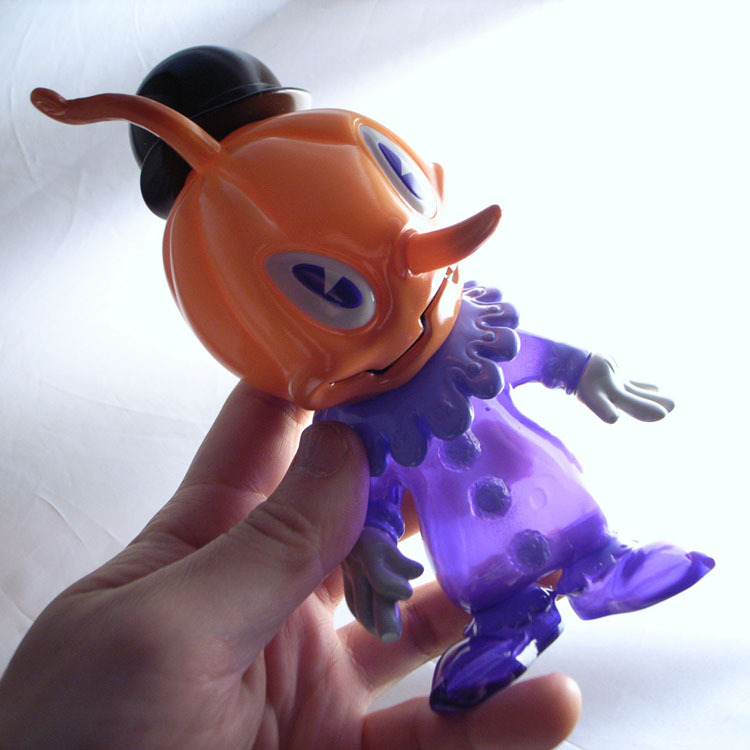 It's only sofbi, but it's still sofubi... not something that could be done in a brief period of time. 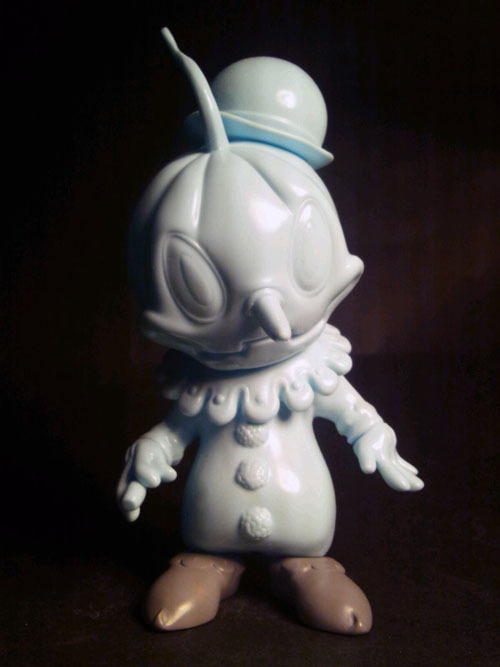 発売は8月25日（土）深夜24:00、詳細は追ってお知らせします This is completed Stingy Jack with new foot, the commemorative first sofbi figure made by Tomenosuke + Circus Posterus. 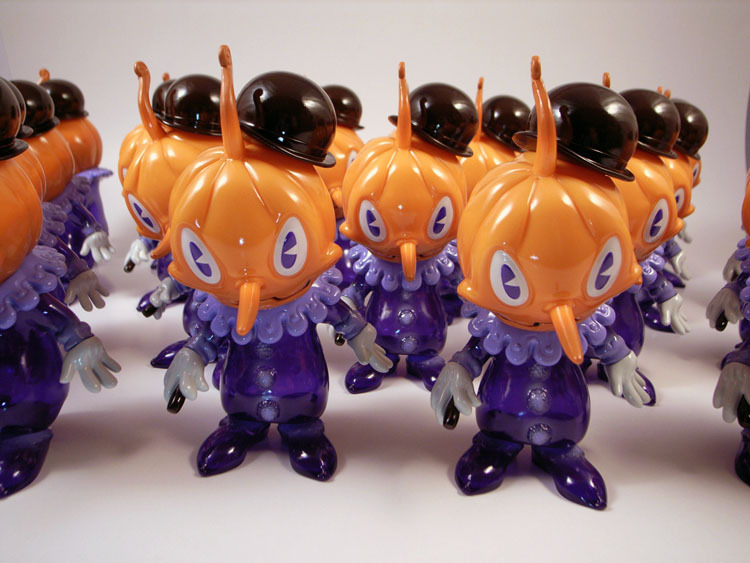 I would like to thank amazing creator Brandt Peters, Yohei Kaneko of Mirock Toy, Shigeta Tanaka of goccodo, and Kikuchi-san of Obitus Plastic Manufacturing who taught me a good lesson. The sale will begin on August 25th (Sat.) at midnight (24:00). We will follow-up with further notice of details. 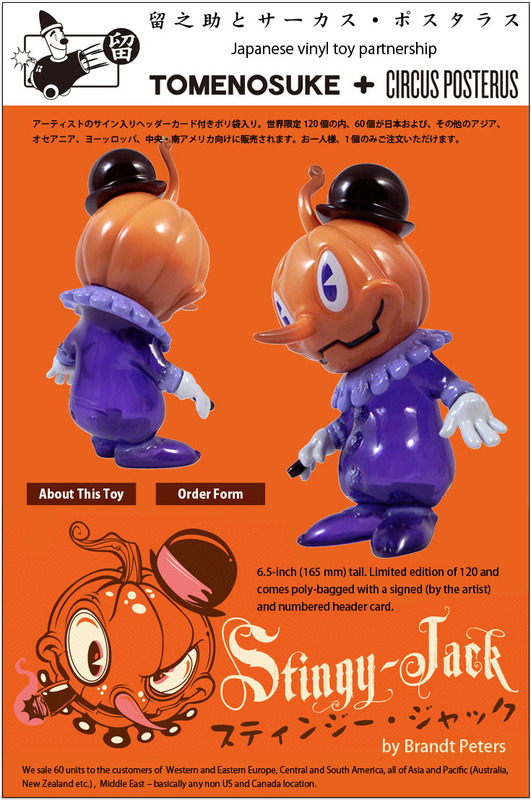 実際に使うカラー・ビニールで抜かれたスティンジー・ジャック。 This is Stingy Jack casted using colour vinyl, which will be actually used. 塗装マスクは目と襟巻き用の3枚作られたが、右手で握る葉巻が指のように見えるため、さらにマスクを1枚作り、塗り分けることになった。 This is a paint test. Two paint masks were developed for eyes and collars. Crew of Obitsu completed this very well with their splendid paint. A cigar held by the right hand looks like a finger. Thus we decided to make additional mask and paint it differently. 画像は彫刻担当の金子洋平君による新しい足の原型彫刻にソフビの本体を載せたもの。 A problem happened. Vinyl material around one of the ankles had deformed because of the intense heat of Albuquerque and has fallen down. Therefore we had to remake the new foot. The picture is when we put the main body of soft vinyl on the model sculpture with a new foot. 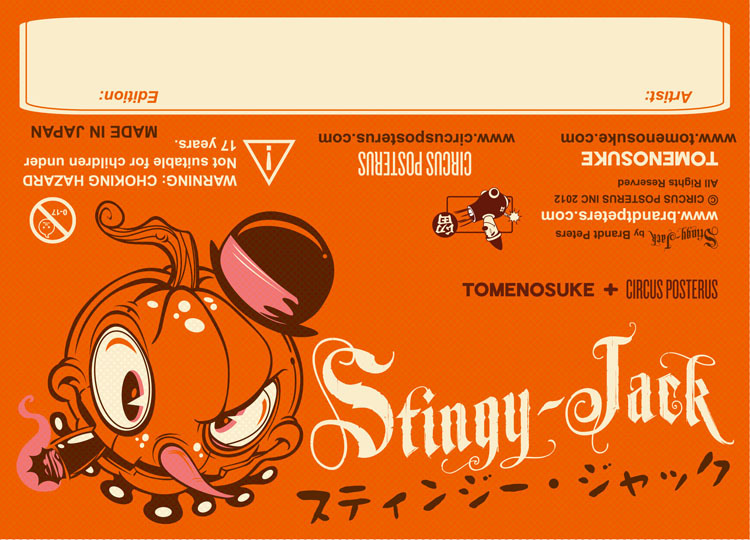 ブラント・デザインのヘッダーカード。 Stingy Jack header card is designed by Brandt Peters.